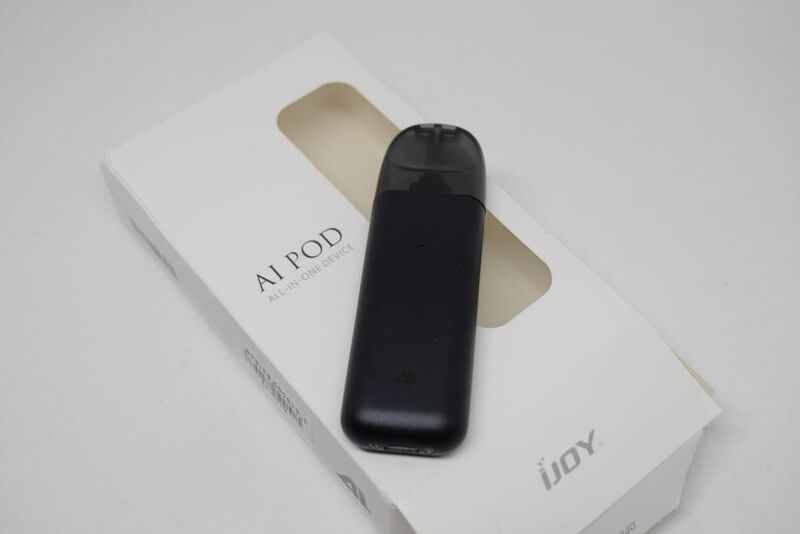 The iJoy AI Pod comes in a small, white, cardboard box with a clear window to the device inside, on the front, and a list of contents, nicotine and age restriction warnings, and company information, on the back. Inside the box we have the all-in-one vape pod, and a smaller box which contains a micro-USB cable for charging, a user manual and a lanyard. 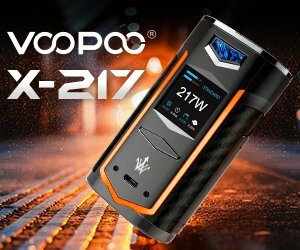 Unfortunately, this device doesn’t come with a spare 2ml pod, which is a big con in my book. While I appreciate iJoy throwing in a lanyard, an accessory we don’t often see included in vape kits, I would gladly trade mine in for another refillable pod. This thing is small enough to fit in the smallest of pockets, so it’s not like I actually need the lanyard, but the extra vape pod? Well, that really comes in handy. Sadly, despite users and reviewers constantly complaining about manufacturers not including spare pods, some companies just refuse to do it. The new AI Pod doesn’t really stand out in terms of design. It’s a thicker USB stick design, similar to the SMOK Novo pod, with a plastic replaceable pod attached to it. 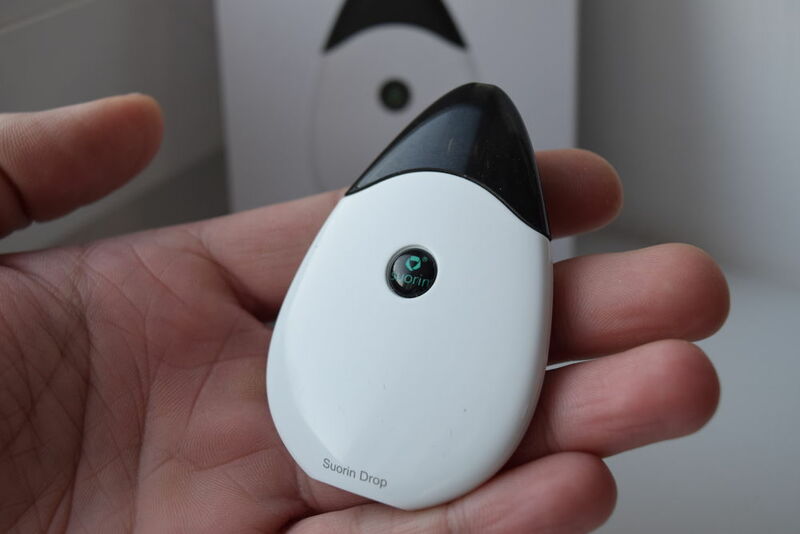 That’s not necessarily a bad thing, after all, pod systems in general are not the most eye-catching vaping devices. 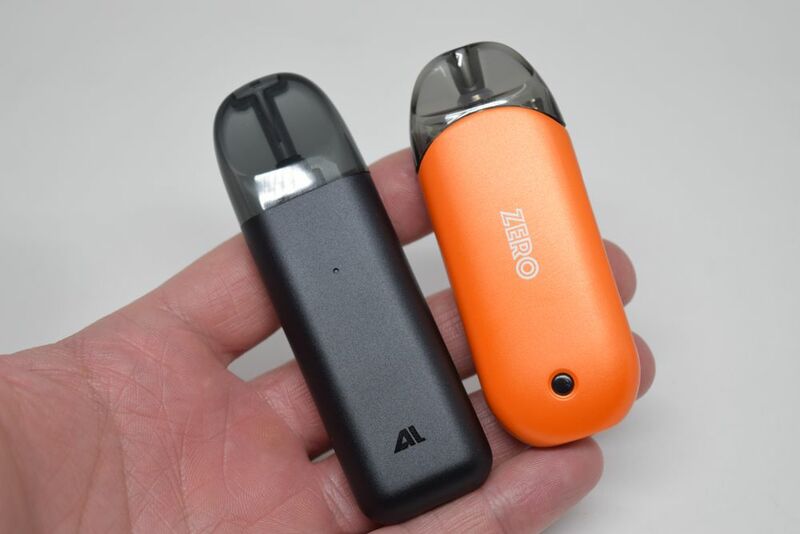 The AI pod consists of a zinc alloy battery section and a polycarbonate replaceable pod. It measures 28mm x 13mm x 91mm, and comes in three different colors, black, blue and red. 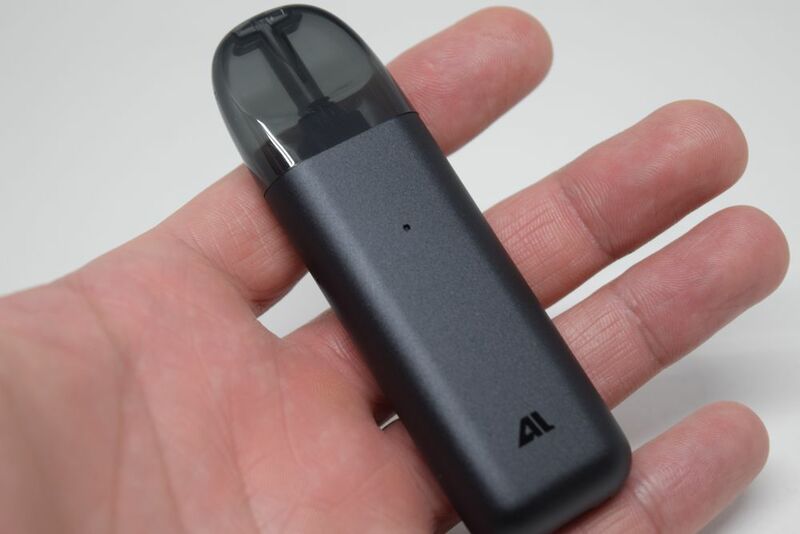 The first time I heard the name “AI Pod”, I assumed this was some sort of revolutionary vaping system that relies on artificial intelligence to deliver the perfect experience, but really this is just your regular vape pod. I don’t even know what the AI stands for, maybe it’s just a marketing gimmick to attract attention, but it definitely doesn’t mean artificial intelligence. 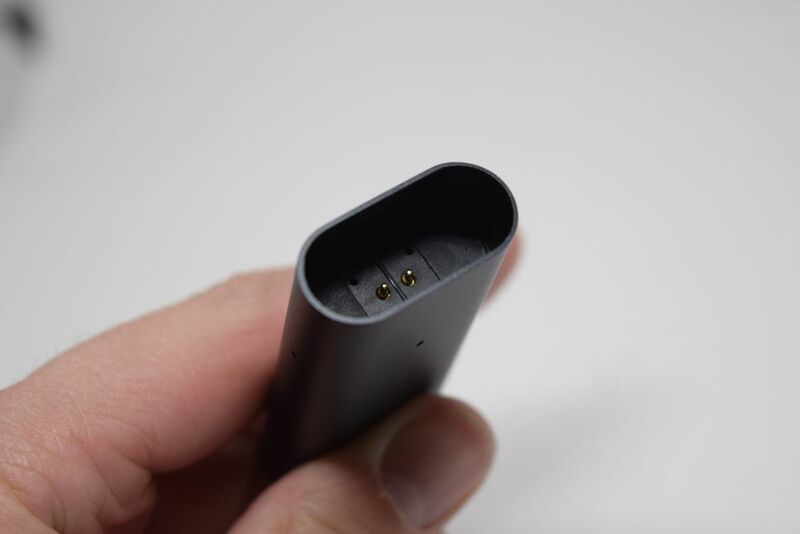 To be honest, the only noteworthy design element on the iJoy AI Pod is the LED battery indicator which is visible on all four sides of the device, so no matter how you’re holding it, you can see how much battery you have left. 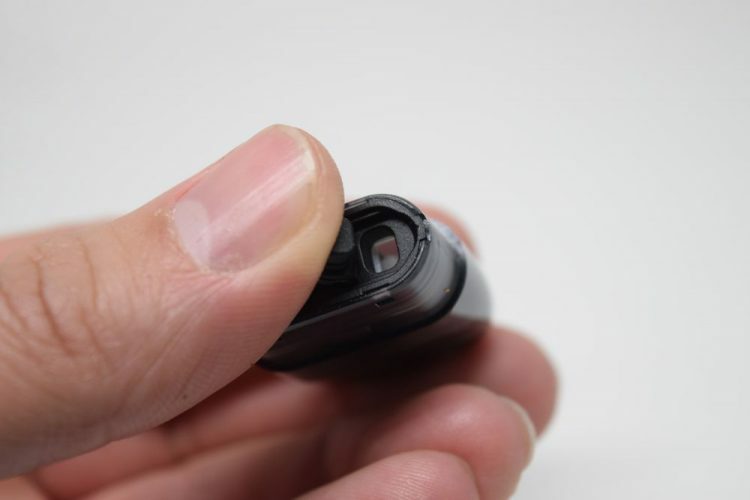 On other devices, this type of indicator is only visible on one side, by punching holes in the battery casing on all sides, at the same level, iJoy made it visible on all four sides. It’s not the most innovative thing I’ve seen, but I kind of like it. Other than that, there’s not a lot going on with this device. It has a micro-USB charging port at the bottom and a small “AI” logo, but that’s about it. The pods aren’t anything we haven’t already seen before either. 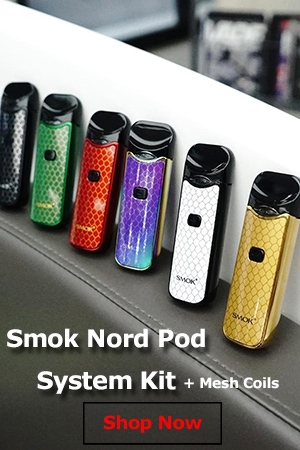 They are similar to the ones of the SMOK Novo (minus the funny taste they give off), only slightly elongated, feature an ergonomic mouthpiece, and a large fill port on the bottom. 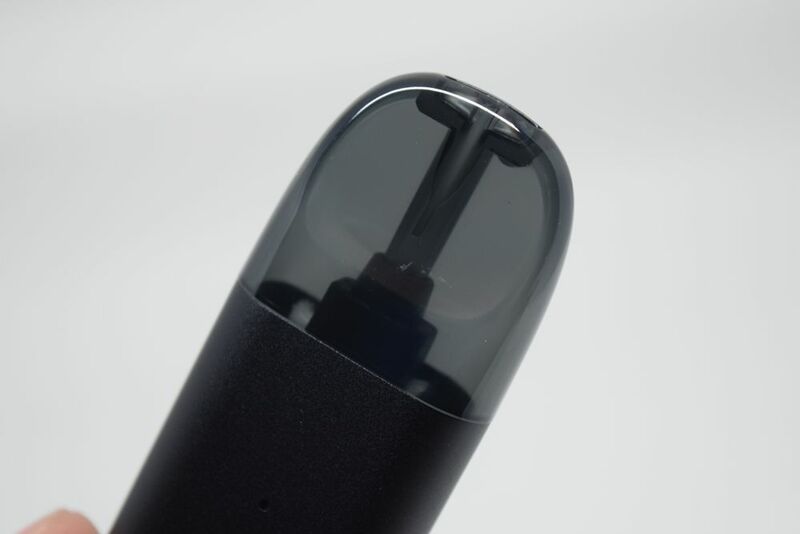 The magnetic contacts are some of the strongest I’ve seen on a pod system, so much so that you may find yourself struggling to detach the pod, so don’t be afraid to put some muscle into it. One thing I didn’t like about the design of the AI Pod was the placement of the airflow slots. As I mentioned, the battery section features holes that make the LED indicator visible on all four sides, only the two on the narrower sides also act as airflow holes. 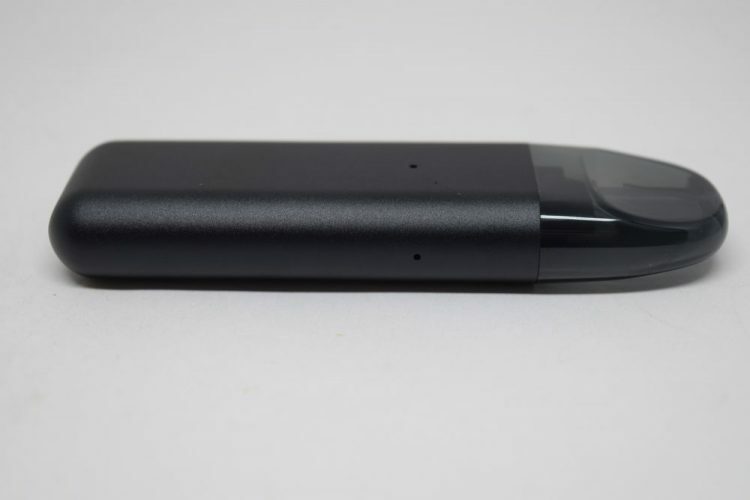 When you draw on the mouthpiece, air comes in through those two holes to reach the heating element inside the refillable pod. The problem is that it’s easy to cover at least one of the holes when you’re holding the device in the hand, which can result in either a tighter draw or a completely restricted one. I guess you can make the case that covering one of these two air slots to get a tighter, cigarette-like draw is a good thing, and I would agree, I just wish it wouldn’t happen by accident, which is how it usually happens when I’m using the AI Pod. 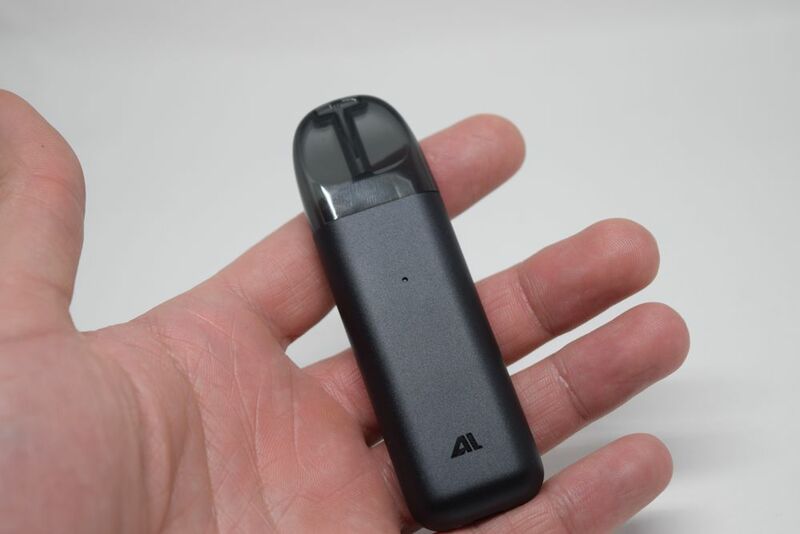 All in all, the iJoy AI Pod feels as solid as any pod system, but doesn’t really stand out in any way, so I can’t really declare myself impressed with it. The iJoy AI Pod features a non-removable 450mAh battery, which is in line with the capacity of most modern pod systems. It also has fast-charging technology, so you can expect to charge it from completely depleted to full in about 45 minutes. Unfortunately, this device doesn’t support vape-while-charging, so you won’t be able to use it while it’s charging. That’s another big con, as far as I’m concerned, as 45 minutes is a long time to go without taking a hit, especially when you really need one. Of course, you can take out the charging cable, get a couple of hits and then plug it back, but why should you have to do that when there are plenty of pod systems out there that can be used while they’re charging? Performance-wise, the AI Pod actually works pretty well. I’ve been using it with some Castle Long e-liquid from Five Pawns, and the delicious combination of toasted coconut, toasted almond, vanilla and caramel tastes as good as it does on my advanced vaping setups, so as far as flavor goes, it’s above average. 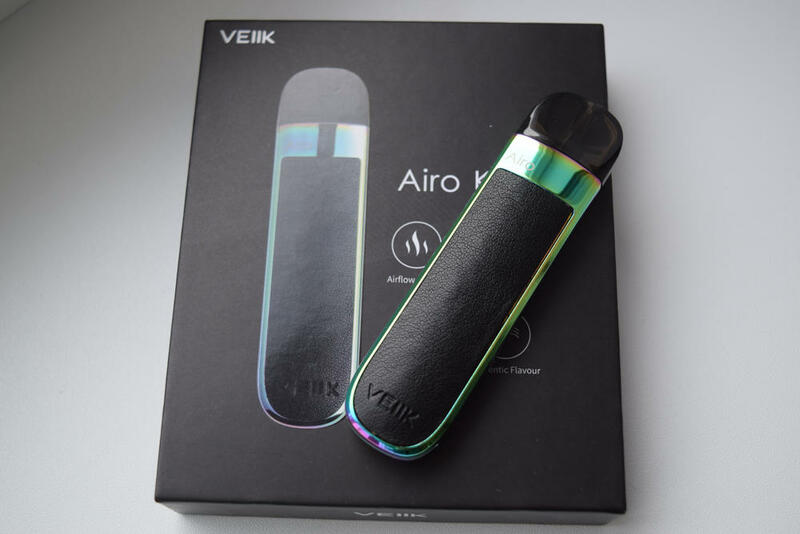 Vapor production isn’t too shabby either, at least for this type of device, mainly thanks to the open airflow, which results in a very loose draw. This loose draw may not appeal to fresh ex-smokers or mouth-to-lung vapers who prefer that tight, cigarette-like draw, but as I mentioned above, you can just cover one of the two airflow holes with your finger when you’re vaping to cut off some of that airflow and make the draw a bit tighter. It’s a lot more versatile in that regard than other vape pods I’ve tried, although I’m pretty sure it’s not by design. I’ve been using the iJoy AI Pod for about five days, and I haven’t had any leaking problems. I do get a bit of juice in my mouth from time to time, but I’m pretty sure that’s just condensation from the pod, as I can definitely see quite a few droplets formed inside the central shaft through which the vapor travels. 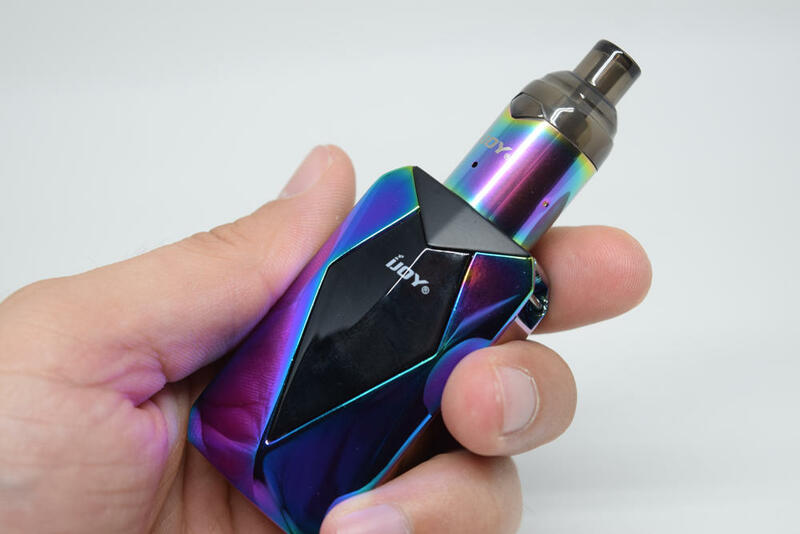 The iJoy AI Pod is a decent pod system, but having tried so many similar devices, especially in the last year or so, it’s hard for me to act all impressed with it. It just doesn’t bring anything new to the table, either in terms of design or performance, and at this stage, I feel we really need some serious innovation. The Renova Zero is a perfect example of innovative vape pod design, and I hope more manufacturers will start implementing their own new ideas moving forward, instead of playing it safe. Unfortunately, with rudimentary devices like the JUUL being as popular as they are right now, there a slim chance of that happening in the near future.